Food dehydration is one of food preservation methods in food industries that have been in use for centuries. It involves reducing the moisture percentage in food to increase shelf life. Most industries dehydrate food by adding energy components into the diet that take up food moisture content. However, the most common dehydrating method is the use of heat by either from a heat medium or the sun. During dehydration by heating, heat runs through the food in hot moisture form. This hot moisture helps draw off moisture contained in the diet. The process involves the simultaneous transfer of heat within food using a medium. In the modern world, this medium of heat transfer consists of the use of dehydrating equipment like the nesco snack master that is an express dehydrator all in one kit. This dehydrator has four trays that you can expand if you need to dehydrate more food at a time. However, have ever asked yourself why you need dehydration in diet? Let us get to know some of its advantages and disadvantages. Taking an example of fruits, dehydrating removes excess water in the fruit. It results in the concentration of fruit sugar giving your fruits intensified sweeter taste. Some of the fruits you can dehydrate include apple, strawberries, pears, and peaches. Excess water down the taste of food and hence proper dehydration should increase the food sweetness. Dehydrated food can be stored for over a long period without going bad. When you store food that is non-dehydrated for a long time microbial decomposition takes place with the help of water inside the food. This microbial decomposition makes the food go bad and become unpalatable. The only option left is to dump such kind of food. 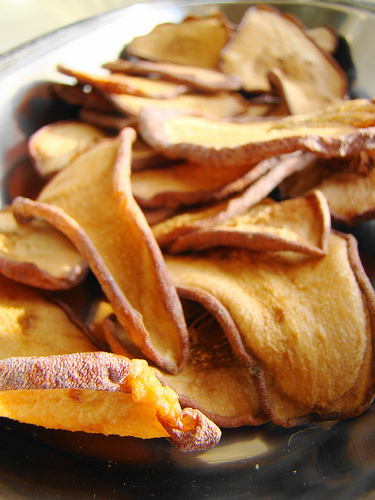 Dehydrating food, therefore, increases shelf life in food and reduces chances of waste. Due to the absence of water in dehydrated food, transportation always becomes easily. Secondly, when you are traveling on a vehicle or driving, with dried food like snacks, you can put a can filled with them on your lap and continue eating while driving. Such kind of food has minimal chance of messing up with your clothes unlike non-dehydrated food like bananas that can mess up with your clothes quickly. Also, dried food is healthier and can last for a long time. Ther are of great importance especially for children in school for lunch since. When you buy processed dehydrated food from supermarkets, it tends to be more expensive. However, do you want to know the deal? You can buy fresh food in bulk from your grocery and do the dehydrating yourself. Doing that will save you a lot of money, you could have used to purchase dehydrated food in supermarkets. That way it gives, you a chance to take up any deal you find on your grocery as well improve your budgeting. Dehydrating food alters food Vitamin percentage in food especially fruits and veggies. Unfortunate this process is permanent. Some techniques used by some industries like exposing food into Sulphur for dying in health risk to consumers. It has also been associated with causing cancer as well. If you are new in dried food, they might be unpalatable to you due to their altered taste. You need to take small peace slowly by slowly until you get used to them. Food that you dry from your home, however, might be pleasant since they are natural unlike those dried from industries using chemicals. People who have diabetes find it uncomfortable to take sugary dried food. It is because dried food has no water to dissolve sugars in the diet. Sugar adds extra calories in the body without nutrient. These calories can be a prune to cause lifestyle diseases in our bodies at any time. Sodium is a component of salt mostly contained in food. Once you dry your diet, you concentrate this salt resulting in it high in percentage. High salt concentration in the feed is a root cause of hypertension and coronary heart diseases. Cases of high intake of sodium are mostly experienced by those who take dried meat preserved using salt which places them in risk at all times. Dehydrated food can be delightful when you can stock them and use during the famine. They are also important especially when you are going for a long distance like hiking and mountain climbing. You, therefore, need to adopt the act of preserving your food today but it is, however, essential to do it in the right way to avoid the experience of the above disadvantages.